Lyle: Are you tuned up and ready to jam!? Listen to the Lesson Sample to hear what you'll be learning in this lesson. Lyle: Here's the jam track and it's 12 bar chord progression. 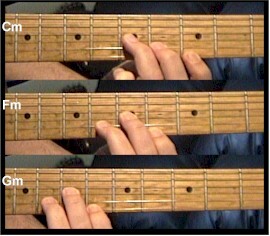 This is a typical minor 1 - 4 - 5 progression. You can call the Cm as the I chord, Fm as the IV, and Gm as the V chord in Cm. In theory, the Cm is the relative minor in the key signature of Eb major, the Fm chord is the ii chord in Eb, and Gm is the iii chord in Eb. Lyle: As far as your tone settings for this rhythm riff, don't use very much distortion because that will muddy up the sound. Try using the bridge pickup, a very slight overdrive setting on your amp, and a little reverb. Lyle: Practice the rhythm riff along to the looping jam track. Try to make your rhythm sound like it's covering mine, so you don't hear my part. Lyle: You don't have to use a massive overdrive to play a solo. Try learning the solo above with a clean tone and notice you can still make it sound cool. Lyle: Dig through these two solo examples and "steal" any of the Blues riffs that catch your ear. Try using them in your own improved solos with this jam track or any other minor jams. Lyle: That's all for this lesson in Cm. See you at the next jam!